The Emily Brown books by Cressida Cowell and Neal Layton were amongst the first picture books that C demanded again, and again. We used to borrow our copies from the library back then - and I got to know "That Rabbit Belongs to Emily Brown" off by heart. Part of the delicious appeal of reading that book was mocking up voices for the various stuffy military folk that the naughty queen sends out to steal Emily Brown's best buddy Stanley the Rabbit. But hark at me going on and on, if you want to see just how much we love the original book and haven't ever heard of it, go read our original review! Emily Brown has been on several adventures since then, and we're absolutely delighted to make her fourth outing "Emily Brown and Father Christmas" our first Booky Advent Calendar Picture Book of the Week for our 2018 calendar. 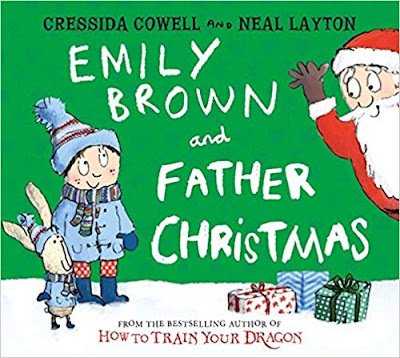 Once again, Emily Brown and Stanley team up for some snowy adventures - but this time they're called on to help a very special old guy who your littlies might be getting excited about a visit from at the moment. None other than Father Christmas. As Emily Brown and Stanley are settling down for Christmas Eve there's a cry of "Ho-Ho-HELP!" from outside their window. Poor Santa has got himself into a right pickle, but thankfully Emily Brown and Stanley are there to lend a hand. In fact it's a particularly bad year for Santa as his sledge gets stuck on a roof, his sat-nav goes absolutely bonkers (yep, know how that feels!) and in the end the poor old gent just feels like giving up. But who will deliver all the presents to little children snug in their beds at home? With a huge dose of Christmas Magic, it's up to Emily Brown and Stanley to save Christmas for everyone! There are so many deft little storytelling touches in this, probably one of the finest Christmas Picture Books we've read this year - and a lovely nod for folks who really loved "Emily Brown and the Thing" as poor Santa seems just as helpless as the aforementioned itchy monster. Neal's illustrations are as fabulous as ever, child-friendly yet chock full of glorious little scribbly details to keep keen eyed kids enthralled. C's best bit: There's a lovely little snug moment at the end of the story we don't want to ruin for you, but aw, you could just hug santa to bits when Emily has finished helping him out. Daddy's favourite bit: Easily a shoe-in for Christmas Book of the Year for us. We waited patiently for a new Emily Brown and Cressida and Neal did not disappoint. It's absolutely magical.